Everything a high performance, luxury express yacht aspires to be. Aggressive styling, high tone elegance married to Regal’s OceanTrac Hull design that delivers speed and brilliant handling. Even in heavy conditions, the 3560’s ride is softer and smoother than other hulls that offer less deadrise. Regal yachts offer enormous storage capacity with designated lockers of appropriate size and location for specific and frequently used gear. A walk-thru windshield takes you to the foredeck where you can lounge on the double adjustable chaise lounge/sunpad. The centrally located cockpit refreshment center has refrigeration and an ice maker, plenty of dry food storage, sink, pressure water, a Corian countertop and glass and bottle storage. Below decks, you will find stunning cherry and holly hardwood flooring, beautiful and resilient Corian countertops in the galley and head compartments, creamy LeatherCrest upholstery and rich cabinetry and bulkheads. A solid wood pocket door separates the forward stateroom from the salon providing maximum privacy. This one-owner, low-hour, freshwater 3560 Commodore weathers the Canadian winters in indoor heated storage. As shown by the photos, she has been meticulously maintained and is the closest thing to “bristol condition” we’ve seen in a long time. 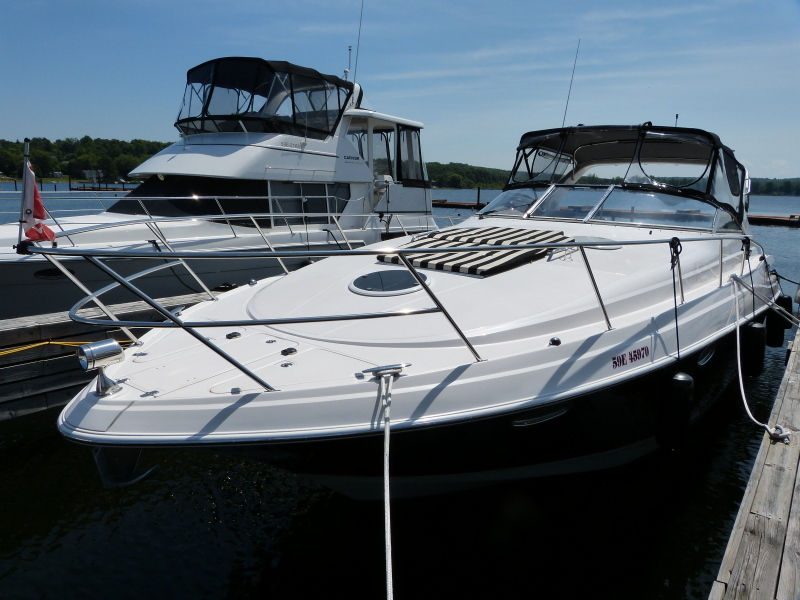 Definitely a “must see” for anyone in the market for a superb mid-size family cruiser loaded with the cruising features that really count.